The Copy Binary software by Craig Phillips, CEO of Amissio Holdings (AKA Amissio Formula) is a very elaborate and malicious SCAM, and we have decided to BLACKLIST it in our fair and impartial review and investigation. Truth be said, we were totally awe-struck when we saw the level of sophistication which was used in this insidious new scheme, and we plan to completely peel off the layers of deception and expose the the people behind the scam. We will also shed light on how they operate and what techniques they use to mislead, bait, and entice potential new victims. As for the nature of complaints we received, it seems inexperienced traders are being targeted and successfully baited. 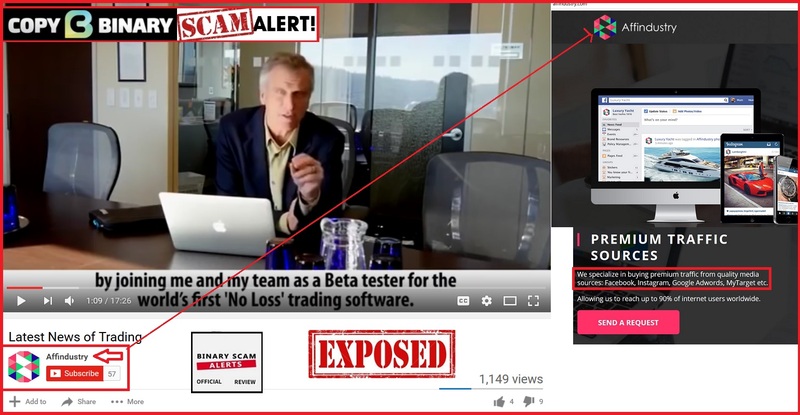 We have received emails from extremely agitated day-traders who have had the misfortune of being victimized by this latest viral SCAM, and it goes without saying that they had their money stolen by sleazy offshore brokers. Keep reading to see how this fraud ring operates and why the Copy Binary fake app and trading robot is a dangerous scam. Official Website, Login Page, and Members Area: http://copybinary.com/? Below is a screenshot of Mr Craig Phillips, the so-called founder and CEO of Amissio Holdings. In reality this is an actor who portrayed similar roles in other schemes such as the Orion Code. 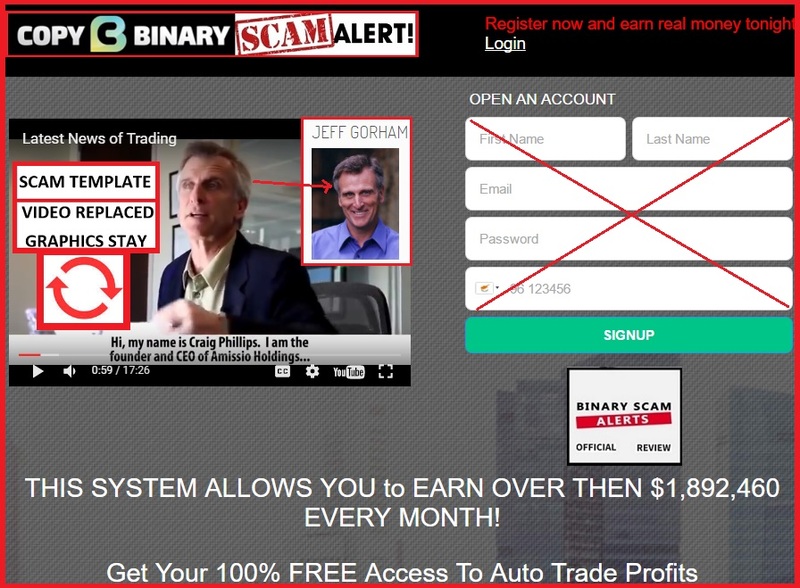 This actor is named Jeff Gorham and he is very active in the binary options scene. What these affiliate con artists did is create a template named “Copy Binary” which is a generic name, and stuck a video inside. So for now its Amissio Formula, and tomorrow it may be a video of the Millionaire Blueprint or Gemini 2. 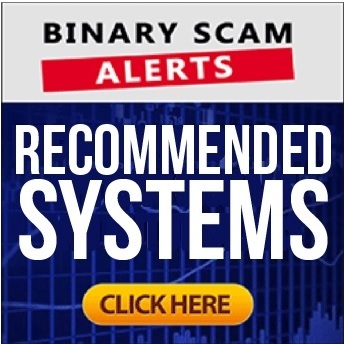 In other words, Copy Binary is as an interchangeable scam platform which is used for acquiring new and unsuspecting customers wanting to make a few bucks trading binary options online. Here’s even more proof! The company which is responsible for producing this scheme is named AffIndustry. You can see it in the video they uploaded, so its very easy to see who is responsible for putting this thing together. Copy Binary is really a complete replica and copy of the Amissio Formula. We have already conducted an extensive review and investigation of this SCAM. In nut shell, Phillips is trying to sell you a “no loss trading robot” and 100% wins guaranteed. We have seen this pattern of deception previously and we are not impressed with fancy cars and expensive-looking offices. Pressure tactics, hyped up claims, lies, fabrications, inflated bank accounts, are just a few of the red flags excessively used in this farcical sham. No, you will have to pay at least $250 to get access to this fraudulent software. The ones to really avoid are Gemini 2 and One Touch Trade. It’s true! Some leading review sites will publish a favorable review about this rehashed scam. If you are deliberating its with good reason. There are many apps which have recently made their way to the market, and the vast majority of these auto-traders are worthless and not to be trusted. Fortunately we have compiled a short list of the best and most consistent money-making machines. These are all showcased in our recommended section. The Copy Binary software by Craig Phillips is a SCAM, and we had to blacklist it in our fair and impartial review. It is used as a generic graphic template where the sales videos can be replaced at any time according to the wishes of the crafty affiliate marketers behind it. If you have received any form of email communication asking you to become a beta tester in this most recent scheme, make sure to unsubscribe immediately and don’t click on any affiliate links. If you believe Copy Binary to be a genuine or legit automated trading app your are deeply mistaken and will surely have your money stolen by scheming offshore brokers. During our in depth and revealing investigation we also found out that spyware was being installed on one of our computers, needless to say we ran a virus check and contained it immediately. If you have have deposited money through this software (which has nothing to do with the Copy Buffet trading app), please do not reinvest and refuse to sign any forms. In light of all this evidence our staff has produced, we encourage all our members and viewers to avoid this travesty and seek alternative trading options. Join our Facebook Group and YouTube Channel to get informed.